You need to use 3rd party ImageMagick package to use this feature. and get the "Win64 dynamic at 16 bits-per-pixel component". I had experienced the same problem initially, then discovered that when installing the IM package, make certain to check the box to include "legacy support". The above step got me past the error shown in the original post, only then to encounter the following result when attempting to carryout a Resize: "ImageMagick indicated failure by returning exit code 1." Any ideas what might be causing this to occur? Yes, new ImageMagick 7 does not include required executable, unless you include legacy support. I need to update Shell Tools to work properly with new ImageMagick 7. Hello Ahto - thank you for your quick reply. 3. result is the same error "ImageMagick indicated failure by returning exit code 1." 5. I repeated steps 1 & 2 above downloading the old IM version 6.9.9-0-Q16-x32-static, and obtained the same error shown in step 3. Then did the same thing for 6.9.9-0-Q16-x32-dll. 6. Always receiving the same error shown in step 3. Your additional ideas on a work around would be greatly appreciated. Thanks much. 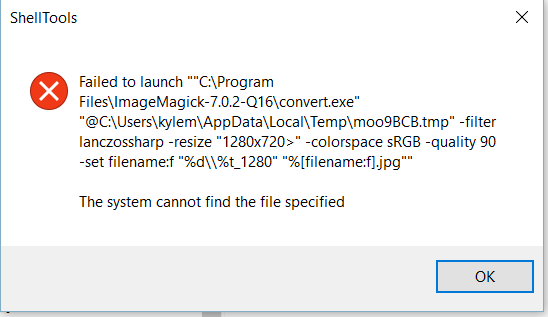 Perhaps there is something with the file itself so ImageMagick is unable to convert it to JPG using given settings. Maybe it is very large (resolution)? Hello Ahto - thank you for your reply. The same error result is returned when tested on a series of jpg files ranging in size from 3.5Mb to 30Kb. Thus, this does not seem to be related to file size, nor to a particular file itself. When installing ImageMagick, you need to check the "install third party apps" or something like this to get the "convert.exe" app installed. But after this, the command line does not work. MG_0592_conv.JPG", it works fine, but with the Moonshell command it does not work. I think there's an error because there's a " > " symbol after the %size% parameter, but there's no kind of " %file% " parameter to tell the command wich file it should use. Hope some MS admin can help?